College wasn’t always a part of life’s plan for Jesse Lynne Ness, a 2004 graduate of Bemidji High School. 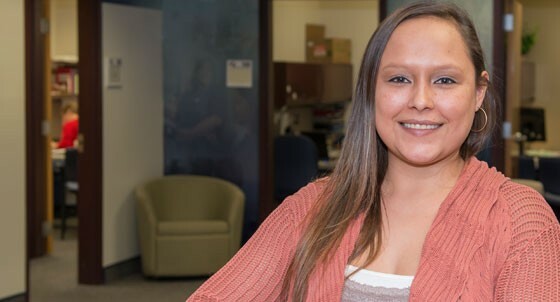 But her mother’s encouragement and support from staff at Northwest Technical College have made a degree — and the career opportunities it brings — a reality for her. Keep tasks and people organized and moving ahead in a fast-paced enterprise. Do you enjoy working in an office setting and interacting with people? The Administrative Support program at Northwest Technical College will provide the knowledge and skills necessary to cultivate a career as an administrative assistant, professional secretary, office assistant or receptionist. Students will develop and strengthen necessary skills such as communication, telephone techniques, computer usage and human relations. Graduates will be prepared to perform office management tasks such as processing incoming and outgoing mail, transcribing business documents, filing and retrieving records, handling telephone calls and making travel arrangements. This is a blended program, with all courses offered online and some available on campus. Online education means you can do your coursework whenever and wherever you choose. That flexibility allows you to be employed while advancing your career. Read this printable flyer to learn more about opportunities available through NTC’s Administrative Assistant programs.